- Heat ghee in a pan and fry red dry chillies, splutter mustard seeds.Then crackle the cumin seeds. - Add the chana dal,fry till slightly brown.Then,add the urad dal,folllowed by broken cashews.Fry them slightly browned. - Put the shredded ginger and green chillies.Saute lightly. - Add in the curry leaves,and spices.Add in the onion.Saute till translucent.Add salt. - Add in the tomatoes.Cook till slightly mashed.Adjust salt. - Add in the cooked rice & toss well. 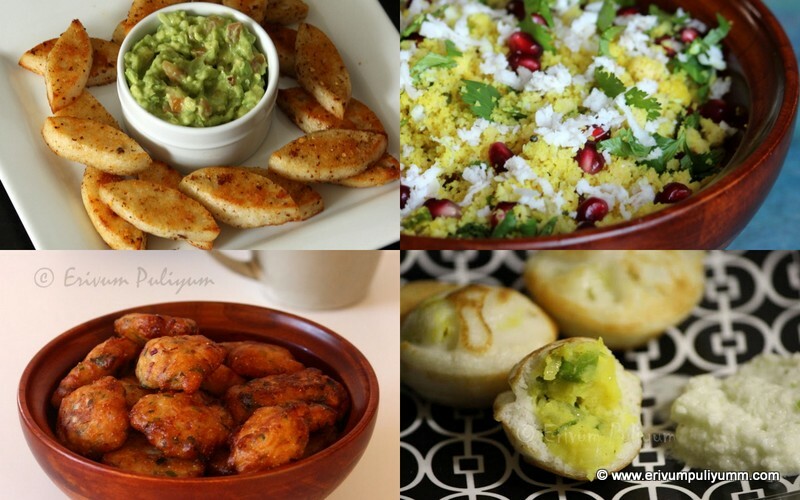 * You can use basmati rice or parboiled rice.I have used parboiled rice, as thats more comfort rice to me. * You can use cilantro for garnish too!! 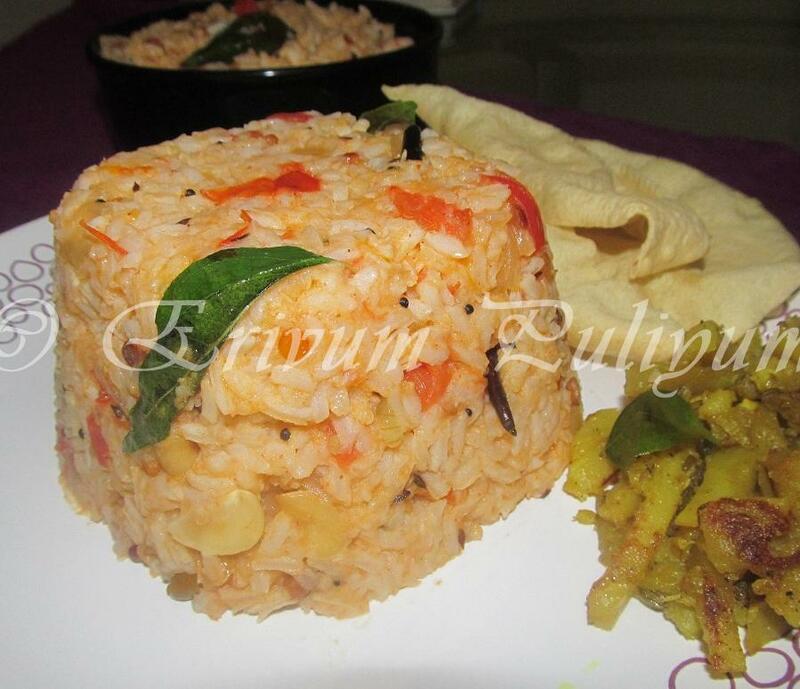 Tomato rice with appalams..yummy.. It's been on my list since a couple of weeks.will have to make it now. 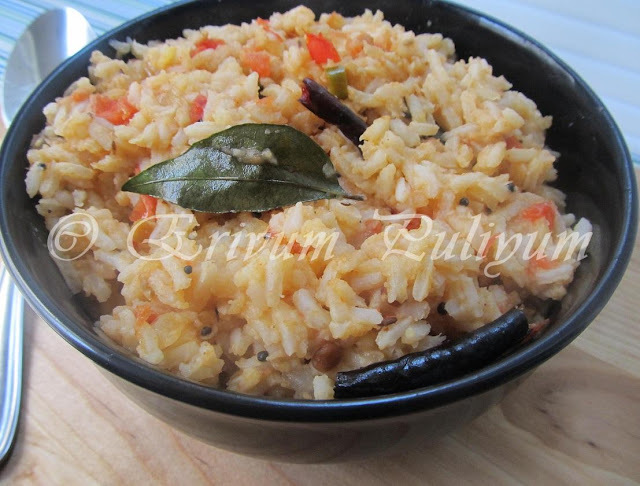 A flavorful tomato rice. Beautiful clicks. love this tangy n yummy rice...delicious preparation!! 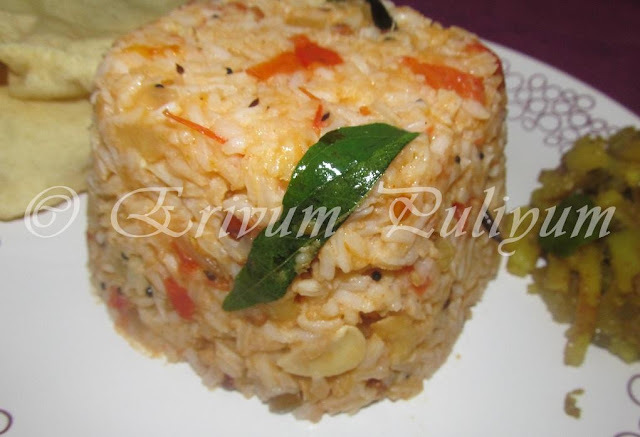 Delicious Tomato rice recipe Julie. I make it when I am busy. Looks yummy and slightly different from what I'd used to cook! Julie thank u so much for ur lovely update on corn. Nice tangy rice, my kids always love to that. 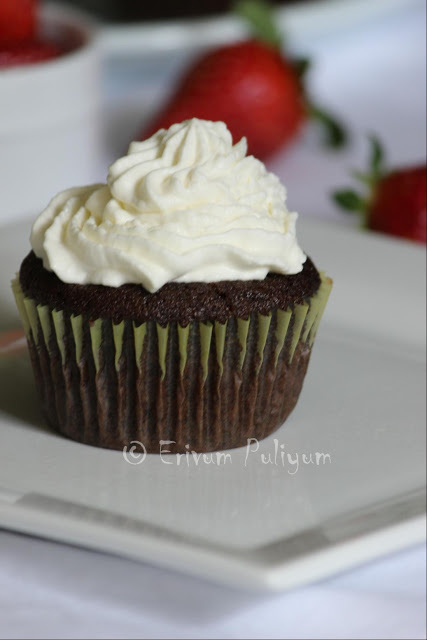 Such a delicious comfort food this is Julie..Looks tempting. a true life saver sometimes :) very delicious..
Its been long I'd this rice.. Very much inviting!! ma favourite yummy tomato rice..
MY FAV FOOD. 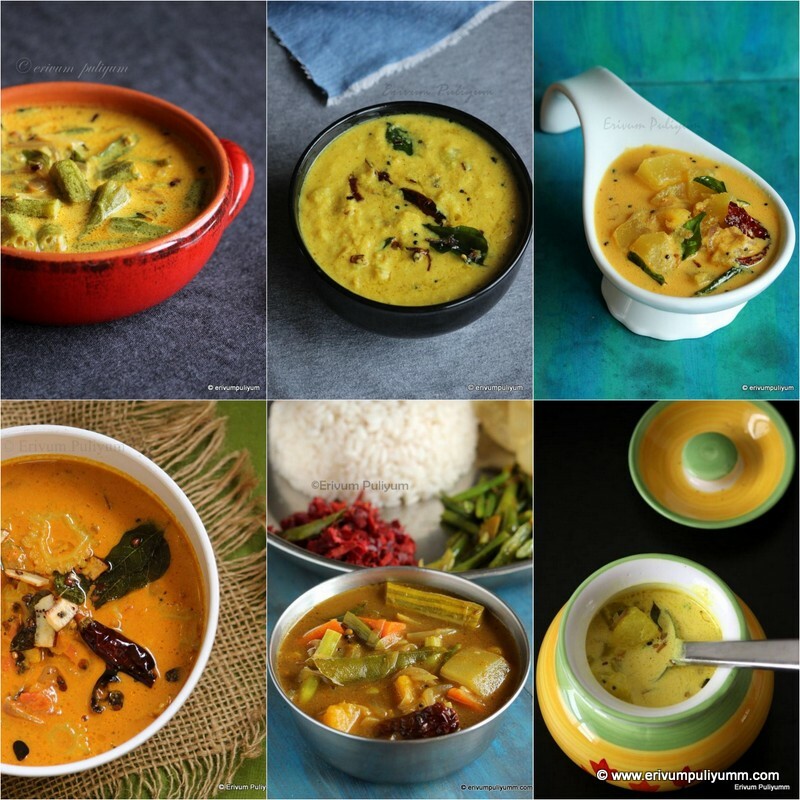 LOOKS YUMMY..
A very tasty and easy to make dish..
nicely served and I like this combination of flavours! Sounds delicious....different from my preparation...love this way! I made this even today...always make this for hubbys lunch box when I dont have enough time in the morning..but never gets time to click it before packing the lunch box ! We make tomato rice in Greece too but with different herbs and spices. I love the flavors you put in this one! 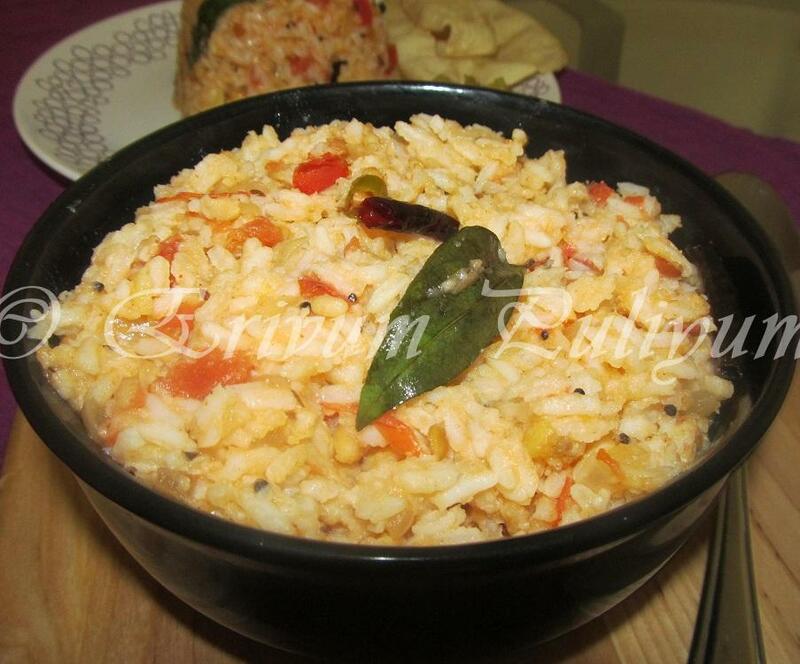 very healthy and easy recipe...love the pictures..
Tangy and yummy rice,comfort one pot meal. Nice preparation..one of my favorites. We always love tomato rice, aromatic and great lunch box.